Another category of materials at the Rakow Research Library is also my personal favorite: the documents. 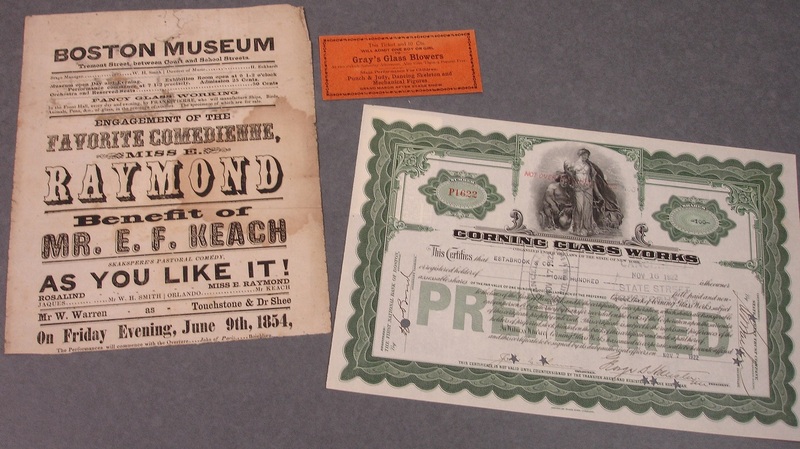 This collection is made up of approximately 7,500 primary source materials including advertisements, billheads, correspondence (personal and commercial), envelopes, glasshouse workers’ currency, invoices, letterheads and stationery, receipts, and stock certificates relating to glass manufacture, trade, industry, art, and design. 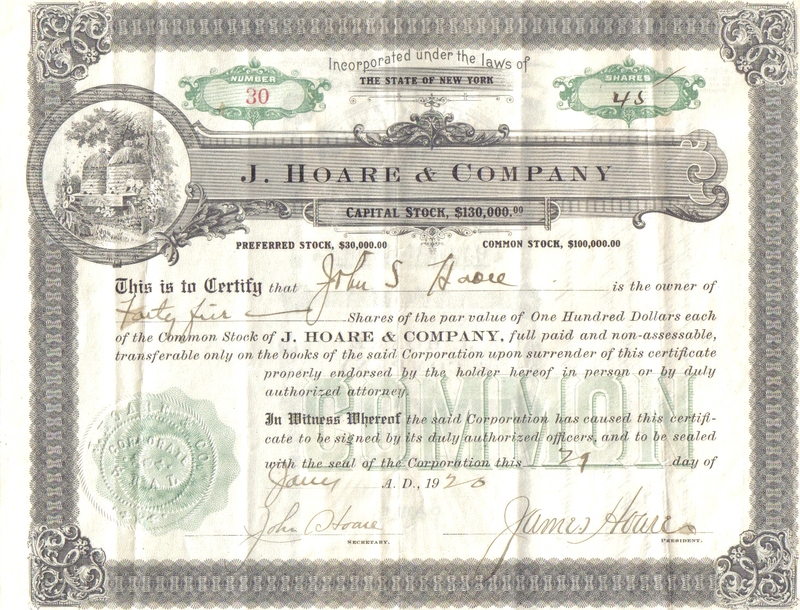 These documents mostly originate from glass production centers in the United States (mostly Northeast and upper Midwest) and western Europe (primarily England, France, and Germany); the bulk of them date from the second half of the 18th century through the first half of the 20thcentury. Perhaps one of the most captivating items from this collection is a letter written by Thomas Jefferson in 1807 during his time as president. His brief words to James Dinsmore concerning glass for window sashes help document plans for his octagonal Poplar Forest plantation retreat in Bedford County, Virginia. This retreat was designed by Jefferson himself as a sanctuary from the popularity of his Monticello home. We have another presidential document within our collection, this one from Dwight D. Eisenhower. 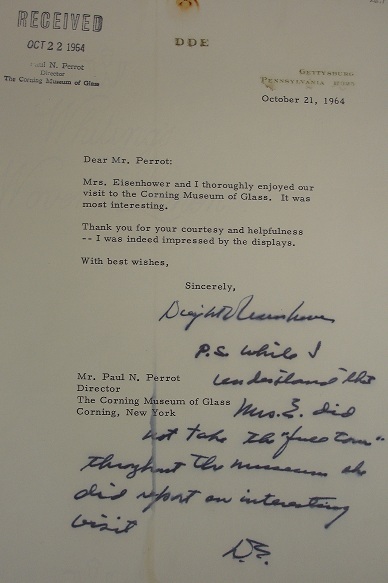 This letter, dated 1964, was written from Eisenhower’s Gettysburg, Pennsylvania home after his visit with Mamie to The Corning Museum of Glass. In it, he thanks former director Paul Perrot for his “courtesy and helpfulness”. Our documents collection continues to grow and there is always something new and exciting to discover. 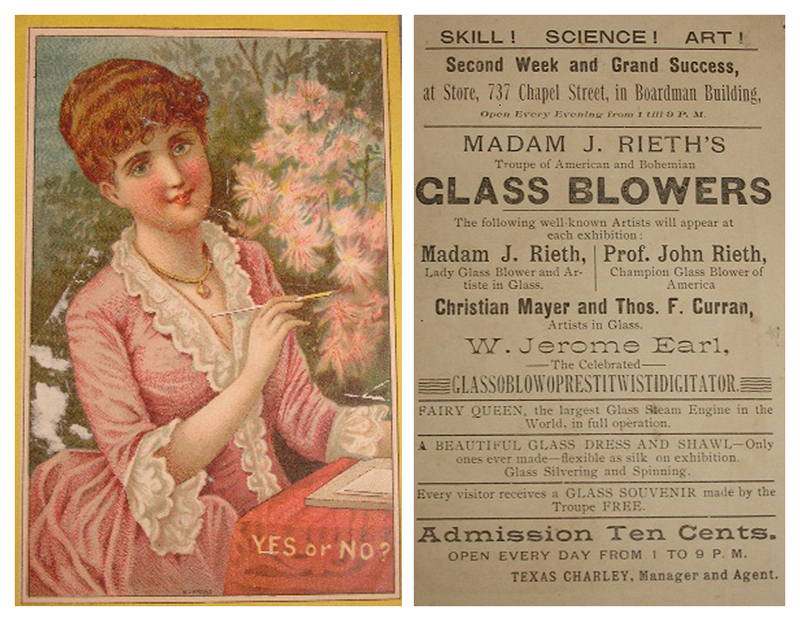 From a 10 cent admittance ticket to see glassblowers on stage performing with Punch and Judy, to a mid-nineteenth century “fancy glass working” advertisement on an As You Like It playbill, to a Corning Glass Works stock certificate, this collection has something for nearly every glass-related interest. The entire collection is available to see here at the Library, so stop by and ask a reference librarian for help! This is the seventh installment of the Rakow Research Library’s Introduction to the Collection Series.